Posted on 30th March 2019 at 7:17 am. Pathways are an important part of any garden. Not only do they get you from A to B, i.e. from your patio to the garden shed, for example, but they can also enhance the aesthetic appeal of your garden, too. 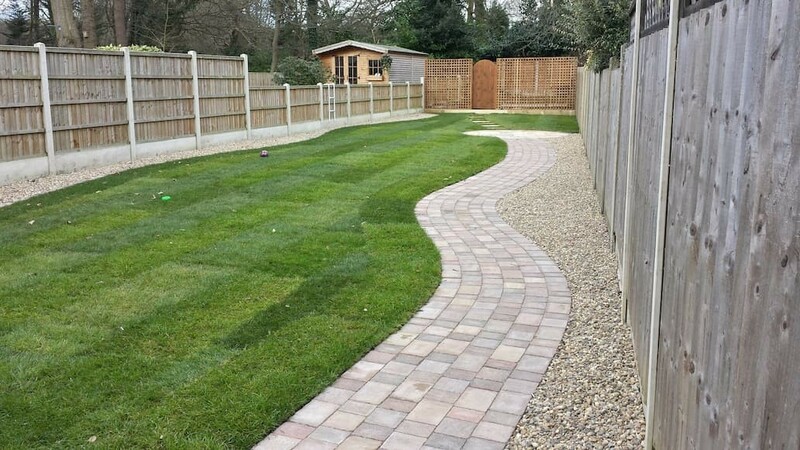 The impact that a pathway can have on your garden means that you need to carefully consider the different types of garden pathway surfacing in order to ensure you choose the best option. Some types of surfacing can be installed by a competent DIYer, whereas others may require the help of a professional landscaper or paving contractor. Some types suit a more modern garden, whereas others may be more suited to a traditional or cottage garden setting. In our latest article, we’re looking at the some of the most popular types of garden pathway surfacing to help you decide on the best option for your garden. We’ll look at some of the pros and cons of each and talk you through the various options open to you for creating your new pathway. Let’s dive in and take a look at our first type of surfacing. Paving slabs are one of the most common forms of pathway surfacing. 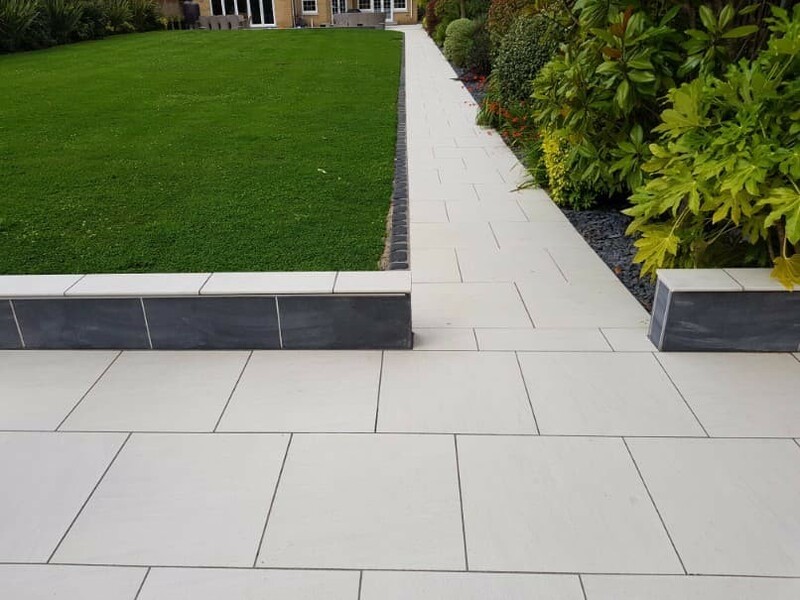 There is a huge variety of paving slabs on the market, meaning you can achieve different looks and find something to suit the surroundings of any garden. Types of paving slab range from concrete to slate, porcelain to Indian sandstone, limestone to travertine, and all are available in various colours, shapes and styles. 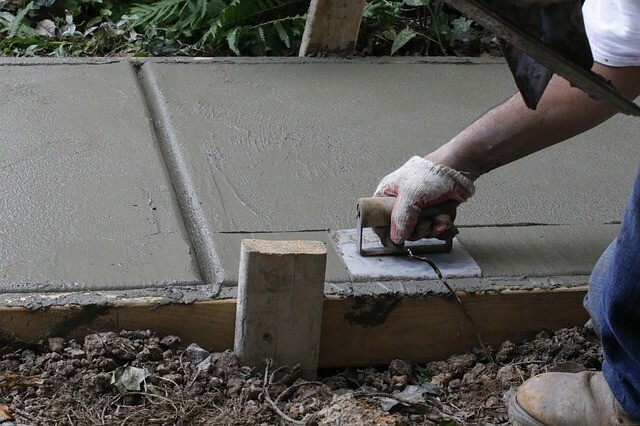 Paving slabs are typically laid on a mortar bed and pointed with either sand and cement or a modern joining compound. When constructing a slabbed pathway, it’s very important to ensure an adequate sub-base is installed prior to laying the slabs. This typically consists of a weed membrane, followed by a compacted layer of MOT Type 1. Paving slabs can not only be used to form straight pathways, they can also be cut or turned to form curved pathways. Resin bound or resin bonded gravel surfacing has become a very popular form of surfacing in recent years. Resin bound surfacing involves mixing aggregates together with a UV stabilised resin adhesive that is then applied with a hand trowel. Once set, the surface can be used for a driveway, patio or pathway. Resin bonded surfacing is very similar but, rather than the two components being mixed together prior to application, resin is applied to an existing surface and the aggregates are then scattered on top of it, which bonds them together. Resin bound surfacing is considered to be the better-performing, longer-lasting surface, as the installation process involves the entire surface area of the aggregate being coated in resin, rather than just the underside becoming stuck to it. There is a huge variety of colours that can be used to create your garden pathway, so you’ll be sure to find something to suit your garden and its surroundings. One of the downsides to resin bound gravel is that it can be expensive – if you have a large area to cover, there are plenty of cheaper alternatives. 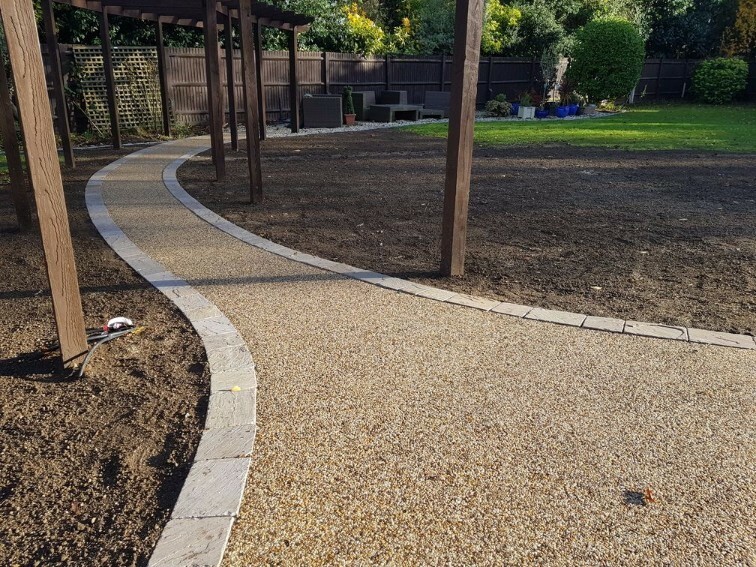 Resin bound surfacing can also be tricky to lay for the DIYer and so, if you are looking to create your garden pathway using resin bound surfacing, we’d highly recommend that you get the help of a local professional installer. However, the look of resin bound pathways is truly unique and will add style to any garden, so it is certainly one to consider for your garden path. Another very popular type of pathway surfacing is block paving. While it’s most commonly used for driveway areas, using block paving to form garden pathways is a popular choice, too. Like paving slabs, block paving comes in a huge variety of styles, colours and materials. The most common form of block paving is formed using concrete, which is moulded to various shapes and sizes. With such a huge selection of block paving available these days, there is something to suit every style of garden, from modern and contemporary to traditional and formal. Like paving slabs, block paving should be laid on a sufficient sub-base, normally consisting of 100mm of MOT Type 1, with 30mm of compacted sharp sand directly underneath the blocks. To give the pathway strength, the outer blocks should be laid on a bed of concrete and the edges of the blocks should be haunched. To help prevent weed growth, we recommend applying weed-free kiln-dried sand, and you can also seal your paving with a sealant such as Resiblock. Believe it or not, artificial grass can also be used to form attractive garden pathways. The huge strides forward in artificial grass technology and manufacturing techniques in recent years have meant that it looks just as good as the real thing. Using fake grass is ideal for those that would like a grassed pathway but need something capable of standing up to regular foot traffic, unlike real grass, which will gradually wear away. As a bonus, synthetic turf provides a mud-free pathway and walking on it is similar to walking on any other hardstanding, such as paving slabs or concrete. Fake grass is also perfect for areas where real grass just won’t grow, such as sheltered areas of your garden that receive too little of the sunlight grass needs in order to remain lush and green. To give your fake turf pathway additional style and interest, why not consider combining it with stepping stones to achieve a truly unique look? A loose aggregate pathway will give your garden additional texture and a distinctive crunch underfoot. There is a huge selection of aggregate to choose from, including granite, Cotswold, gravel, pea shingle, limestone, slate chippings or even marble chippings. We would highly recommend installing a plastic honeycomb or cellular grid system, such as those produced by EcoGrid, as they help to retain the aggregate and prevent it from migrating away from your path. Loose aggregate pathways are best complemented by some form of edging, for example, by combining it with block paving to form an edging block, or some other form of pathway, such as Everedge. For a softer, more natural-looking pathway, how about using bark chippings? Bark chippings are quick and easy to install and they are probably the most cost-effective form of pathway surfacing on our list. Simply remove the existing surface, if necessary, then install a weed membrane (we recommend using one that’s black in colour, so it’s more concealed) and spread your bark chippings on top. 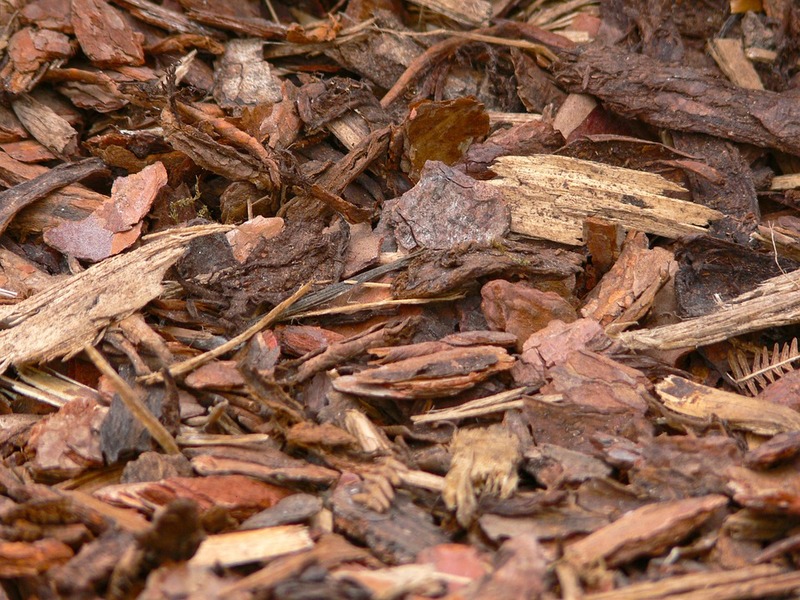 The only downside to bark chippings is that you’ll find that there is plenty of movement in them, so you’ll have to relevel your pathway from time to time. Strong winds can also potentially blow the chips around your garden, so this type of surface is usually best used in sheltered areas of your garden. However, it will look more natural and not as harsh as some other types of pathway surfacing, and so provide a more subtle garden path. The last type of pathway surfacing on our list is concrete. Concrete is a cost-effective way of creating a hardstanding within a garden and it can be used to create beautiful pathways. It is possible to dye your concrete various different colours to create a unique look. You might also wish to use stencils to imprint various patterns within the concrete, to give the appearance of slabs, pavers or bricks. The downside to concrete pathways is that, eventually, they begin to crack. Once this starts to happen the pathway can be repaired, but the repair work tends to be noticeable and will make your pathway look patchy. This is in contrast to block paving, for example, whereby blocks can easily be lifted and replaced as necessary. There are many different types of garden pathway surfacing on offer and deciding upon the best option can be a difficult choice. Often, it comes down to budget, and it’s therefore important to work out the costs involved for the various types of surfacing, to aid you in making your decision. Also, if you are capable of building your own pathway, you’ll find that the total cost will be far less than hiring in a professional. But, of course, you’ll need to be confident that you can do a good job, otherwise, it could end in disaster and end up costing you more money because you have to get the help of a professional to rescue the situation. You’ll also need to consider the style of garden you are trying to create and choose a surfacing that will enhance the surroundings of your garden. 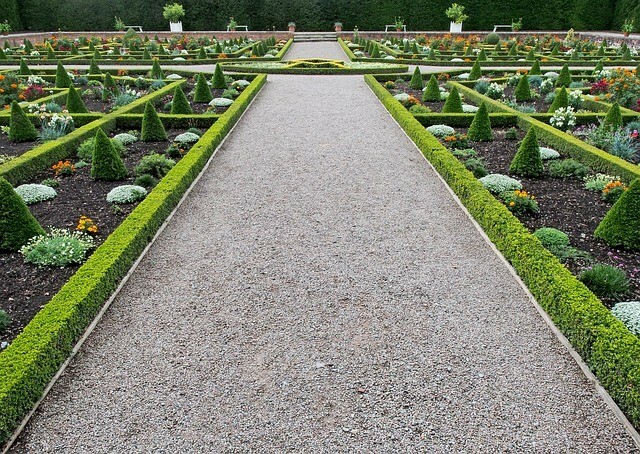 What’s your favourite type of garden pathway surfacing? Let us know by leaving your thoughts in the comments section below.